After much delay, possibly due to government meddling, Google Street View finally went live in select Canadian cities last week! Most of the GTA is covered, along with Kitchener/Waterloo, Ottawa, Montreal, Quebec City, Halifax, Calgary and Vancouver. This likely ensures coverage for a majority of Canada’s population, if only a very small minority of its geographical area. 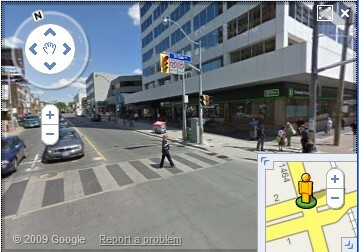 This is a welcome move, since street view has been available for our neighbours to the south for the past two years. 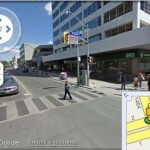 According to some reports, Street View was supposed to launch in Canada earlier this year, and some of the imagery was collected as early as 2007. (Though the images around my area seem to be from early this year) Oh well, this is better late than never! I’m speculating that the government’s concern with Google Street View may have slowed deployment, as in 2007 the privacy commissioner voiced strong concerns against the technology. I’ve never believed any of that FUD, but it seems that their concerns have been addressed with Google’s automatic detection and blurring of faces and license plates, along with new straightforwards processes to request that your image be removed from the service. But it’s still been much ado about nothing, not really like the conflict between the government and Facebook earlier this year, which was also subsequently resolved. In the case with Facebook, privacy settings were often complicated and unclear; with Google Street view, they’re merely providing public views of public places, so I don’t see what the problem with that is. You can also use Street View on the built in Maps app for the iPhone OS, though it’s a bit convoluted since there’s no “Street View” button to toggle. Instead, you must first drop a pin (click on the “layer peel back” icon in the lower right corner) and then bring up the dialog box for that pin. If it’s in an area with Street View present, the little guy icon on the left will be lit up and you should be able to click it to bring up Street View. Street View only works in landscape mode but it’s still pretty useful for getting to know an area before you visit it for the first time. Sometimes an actual image can convey sense better than just a map. It remains to be seen how the launch of Street View in Canada will fare for the similar service launched by Canpages in BC. That service only covers Vancouver, Whistler and Squamish but was launched back in March. Nonetheless, it’s very neat technology, even if it was originally unveiled over two years ago. Witness this by the fact that reporters are still drooling over it by embedding the service in every article covering the launch.